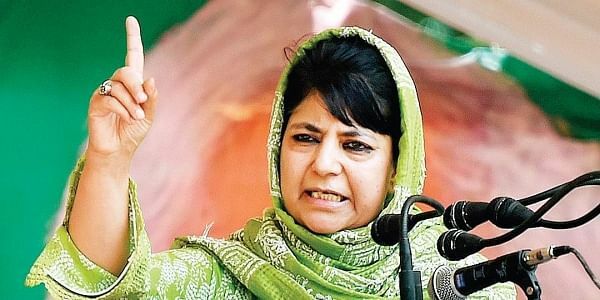 Stating that eliminating militants alone will not solve the problems of the state, Mehbooba Mufti has called for a change in the present discourse on militancy, fighting, crackdowns. PANAJI: Jammu and Kashmir needs a "healing touch" policy for the political process to take over, the chief minister of the state, Mehbooba Mufti, has said. Stating that eliminating militants alone will not solve the problems of the state, she has called for a change in the present discourse on militancy, fighting, crackdowns etc. "Those in the Army and other security forces feel that they have done their job to a great extent. Now, there is a need for a healing touch policy for the political process to take over," Mufti has said. She was speaking during an interactive session with the audience at the 'India Ideas Conclave 2017', an initiative of the India Foundation, last evening. "They (security forces) have created a conducive atmosphere. There is a general feeling among the police and security forces that they are doing their job, but they alone cannot do it," Mufti said while responding to a question from a participant about the possibility of adopting a soft approach towards the separatist elements in the Valley. "We need to have a healing touch policy. It does not mean (going) soft. If tomorrow, the court lets (hardline separatist leader) Masarat Alam go, in a democracy, what can you do? "If he (Alam) goes to the Supreme Court and the Supreme Court says there is nothing against him now and that you can't hold him back anymore, what will you do?," she asked. "Would you say no?...No, you can't! You have these institutions. We cannot undermine these institutions for the sake of one person because one person cannot create a havoc," Mufti said. "If we kill 200 militants, 200 more will come from Pakistan, what to do?," the PDP leader said. "We need to do what we did during (Atal Bihari) Vajpayee's time. I am sure the situation can be turned around," she said, referring to the peace initiatives taken by the former prime minister with Pakistan. "Today, the discourse is about militancy, fighting, crackdowns. We need to change that discourse and that is where the whole country has to help us. "It is not that you will give us a pill and change everything overnight. I remember when I was young, people used to say 'Mufti saab bahut achhe hai, par Hindustani hai' (Mufti saab is good, but he is an Indian). Many people would say that. I wouldn't understand that if he was a good person, why were they saying he was a Hindustani," she recalled while referring to her late father, Mufti Mohammad Sayeed. "For me, India was Indira (Gandhi). For me, India was Taj Mahal...it was the movies we used to watch. There are lakhs of people like me (in Jammu and Kashmir) who understand India and there are those, in the minority, who do not believe in it," she said. "The quicker we get out of this situation, you will not need to teach nationalism to Kashmiris, but in fact, they will teach you (nationalism)," she said.